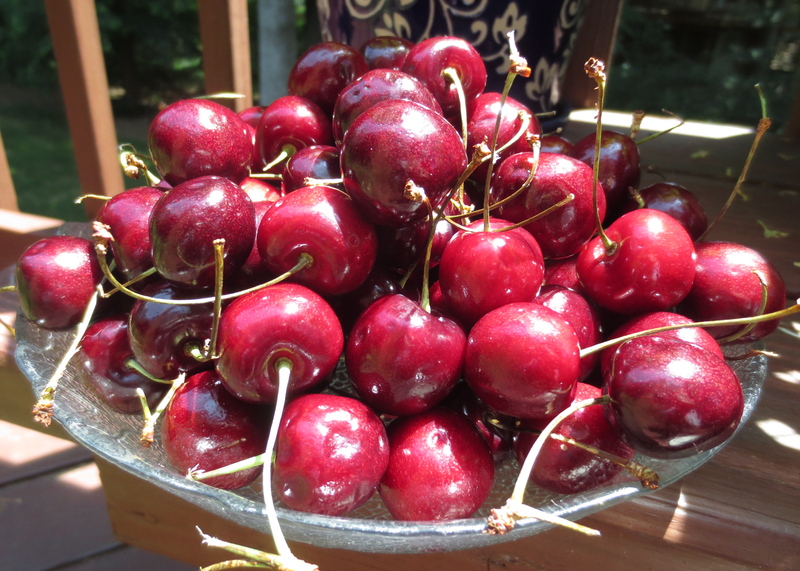 Enjoy a fresh bowl of cherries, while sitting on the porch reading your favorite books!! For me summer does not officially start around Memorial Day or at the June solstice, it has always begun on July 1, my birthday. And nothing says summer like a fresh bowl of cherries, freshly cut flowers, a free concert or a deliciously cold Mojito. The older I get I find myself relishing an uncomplicated lifestyle along with the simplest of pleasures, which can merely be found by opening your front door. Plump orange Asiatic Lily flowers on the deck are enjoyed from the breakfast room or family room during the early part of summer!! This photo was taken as the sun was setting the other night. Where is it written that that spending large sums of money makes you blissfully content. Nothing tops cavorting with friends while listening to Reggae music at the Reston Town Center after dark or watching butterflies move about the garden. As the warmer weather rolls around it is definitely time to move at a much slower pace and steal a bit of self-indulgence for yourself. Build time into the day for those unexpected luxuries such as sitting on the porch sipping mint tea and doing absolutely nothing or stargazing during the evenings waiting for the moon to rise. Get into spirit of the season because, you will not have to spend a cent or least a fortune! Happy Birthday K. Your description of summer simple pleasures is truly the epitome of what everyone should experience many times over. To be able to relax and enjoy summer’s beauty with a COLD drink is a pleasure indeed. 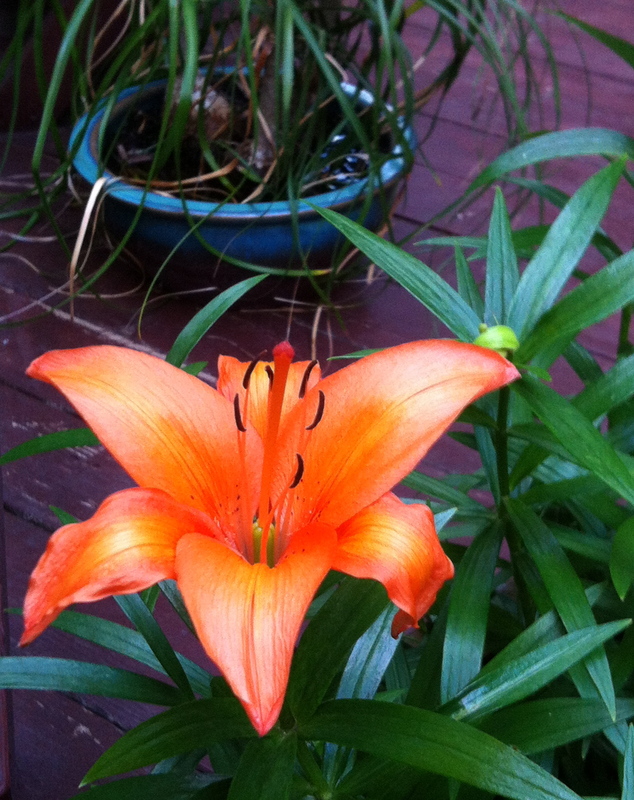 Love your pic of the Lily on your deck. Beautiful summer color. Nice post. Enjoy your birthday and keep the stylish post coming. I have truly enjoyed my birthday today, celebrating was definitely low key. The family enjoyed a delicious Chinese dinner (absolutely my favorite meal). Now we are ready to watch the sun set on the front porch!!! Stay stylish and thank you so much!!! Happy Birthday! I loved this post, as it reminded me to enjoy the simple pleasures that surround us, especially during the summer. Stay stylish! Theses lilies are so short-lived. They bloom quickly, but the leaves are a beautiful bluish-green throughout the summer!!! Thank you so much!!! Sounds like a fabulous birthday you celebrated today. Indeed the finest things in life are tantamount to the to the simpler pleasures that are easily attained. Sounds like a plan for a great summer. Enjoy! The finest things in life are truly the simpler pleasures. To be enjoyed throughout every season!! !